DERMATOLOGIKUM BERLIN – the largest private dermatological practice in Berlin. It is our aspiration to give you the best possible medical counsel and treatment coupled with sufficient time and individual care in a pleasant ambience. We offer you the complete spectrum of the area of expertise “Dermatology & Allergology” as well as selected treatments from the field of expertise “Plastic & Aesthetic Surgery”. We care for patients from Berlin, Brandenburg, Germany – and of course for international patients from around the globe. With currently 8 doctors and the practice’s space exceeding 1000 square meters, DERMATOLOGIKUM BERLIN is Berlin’s largest private dermatological practice. Apart from the highest quality of medical care, it is also important to us to provide a good service including short-term appointments and short waiting periods to ensure the high satisfaction of our patients. DERMATOLOGIKUM BERLIN – more than 100 years of medical experienc. 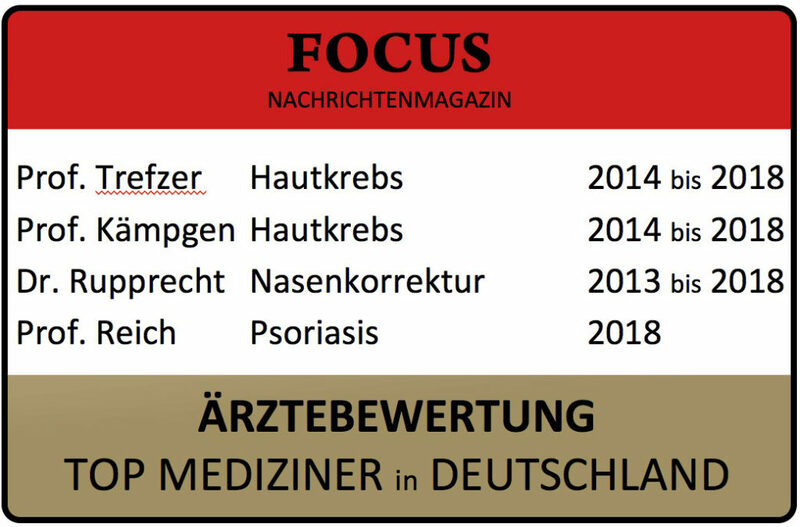 In 2013, the five dermatologists Prof. Trefzer, Prof. Kämpgen, Dr. Rupprecht, Prof. Reich and Prof. Steinkraus established the joint practice DERMATOLOGIKUM BERLIN. The founding partners each possess more than 20 years of medical experience and are regarded as outstanding physicians in their respective areas of expertise. This is, among other things, reflected by the – at this point – 13 times they were mentioned in the FOCUS list of best German doctors. DERMATOLOGIKUM BERLIN therefore pools knowledge and experience like hardly any large dermatological clinic does – all in one practice. DERMATOLOGIKUM BERLIN – in the heart of Berlin, of course in Berlin Mitte. DERMATOLOGIKUM BERLIN is located in Berlin Mitte at Friedrichstrasse 89 on the fourth floor of the “Upper Eastside Berlin” building right next to “Kulturkaufhaus Dussmann”. With its central location between the train station “Friedrichstrasse” and boulevard “Unter den Linden”, the practice can be reached easily. Public transport brings our patients into walking distance. Train and underground stations are in immediate proximity and the central station can be reached in less than 15 minutes. There is parking space reserved in the underground garage for patients arriving by car. DERMATOLOGIKUM BERLIN – more than a “usual” dermatological practice. At DERMATOLOGIKUM BERLIN we offer you the highest quality of diagnostics and therapy. For each dermatological question we have a specialist who will both explain and give you the best possible treatment in accordance with the latest medical insights. In the medical speciality “Dermatology & Allergology” we treat the complete spectrum of skin, mucosa, hair and nail diseases – from head to toe, from hair loss to foot fungus, from psoriasis to malignant melanoma. One of the emphases of DERMATOLOGIKUM BERLIN is the treatment of all kinds of skin tumours – from skin checks via skin cancer diagnostics through to skin cancer therapy. Naturally, also inflammatory and immunological skin diseases are treated and allergological issues are yet other emphasis. Aesthetic questions are treated in accordance with the latest medical insights using cutting-edge devices and preparations. DERMATOLOGIKUM BERLIN – here, you can also find “Plastic & Aesthetic surgery”. The area of expertise “Plastic & Aesthetic surgery” at DERMATOLOGIKUM BERLIN is characterised by a high degree of specialisation. This means that not all procedures of the very diverse medical speciality “Plastic & Aesthetic surgery” are offered. By the same token, there is outstanding expertise and far above-average experience regarding the procedures available. Aesthetic & functional rhinoplasty as well as aesthetic & functional eyelid surgery are performed by Dr. Rupprecht at the highest international level. All in all, plastic and aesthetic surgery of the face – including of course conservative therapies like botulinum toxin, hyaluronan, laser etc. – constitute the treatment focus. Selected plastic surgical therapies of the torso and limbs compliment the spectrum. Of course, plastic surgical techniques are also used when there is a medical indication, for example when surgically treating facial skin cancer. DERMATOLOGIKUM BERLIN – a practice for all patients. DERMATOLOGIKUM BERLIN is an exclusively private practice. This means that all treatments are charged according to the medical fee schedule. The bill is always sent to the patient him- or herself. Privately insured patients are refunded the treatment cost for medically indicated therapies (fully or proportionally, depending on their insurance’s scale of charges). Patients with statutory health insurance can of course also get treated at DERMATOLOGIKUM BERLIN. They also receive a bill in accordance with the medical fee schedule. Since a direct settlement with statutory health insurances is principally not possible and patients with statutory insurance therefore need to bear the cost themselves, we always inform you of any costs incurred upfront. Appointments at DERMATOLOGIKUM BERLIN can – depending on personal preference – be made via telephone, e-mail or our online appointment booking. Berlin Mitte is international and so is DERMATOLOGIKUM BERLIN. We regularly treat patients from multiple different countries. All doctors at DERMATOLOGIKUM BERLIN speak English fluently so that a good communication is possible with most international patients without any translation. Otherwise, the presence of an interpreter can be organised.